Posted in Hair, Outfit, Pose, Uncategorized. I have been out in RL today but wanted to post real quick about Catwa’s new lashes hud gift at their main store. 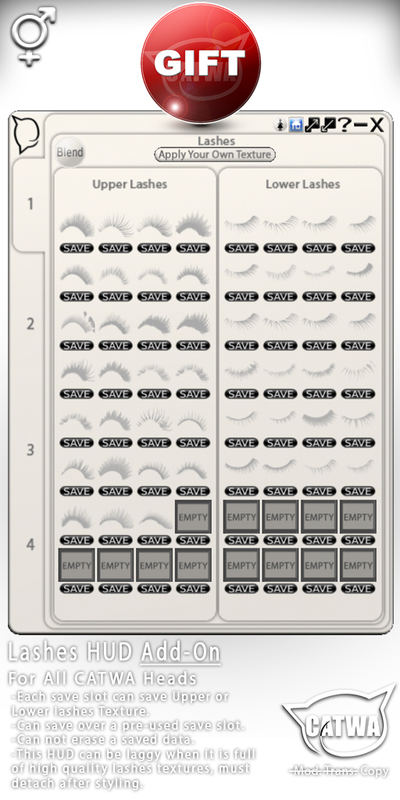 The hud contains twenty-eight different lash texture for top and bottom. The first eight are the ones already on the head you get when you purchase any Catwa head but there is twenty new ones for you to use to complete your look. You will need to be in the Catwa group but it is free and you can join it from any of the kiosks located in the store.